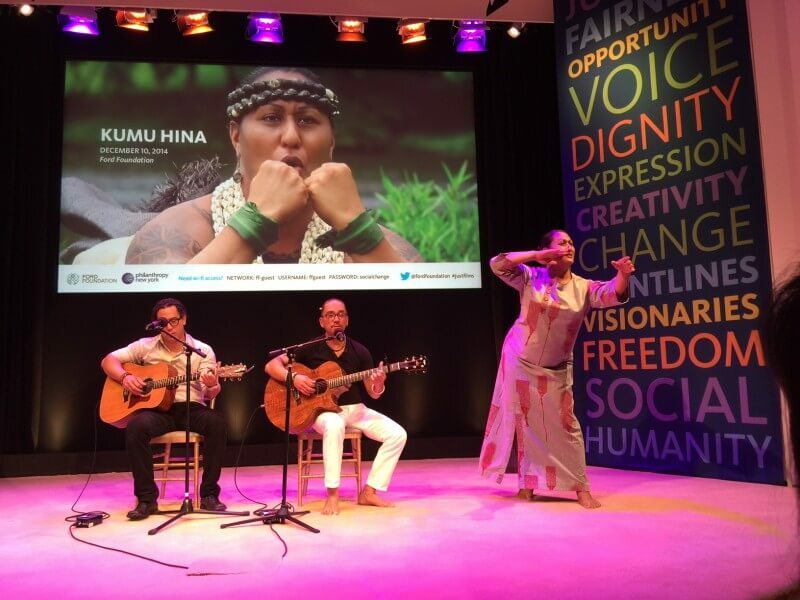 Kealiʻi Reichel commenced the program with a chant. Joined by Shawn Pimental, he performed Koali and E O Mai. Kumu Hina danced E O Mai (as pictured above.) I am used to Kealiʻi having a much bigger production complete with a full band and troupe of dancers. I found it refreshing to see this stripped down, duo of acoustic guitars, in such an intimate setting. The music and hula were sweet. To close, I was joined by Claudia Goddard, Jason Poole and Kristabelle Munson to lead everyone in singing Hawaiʻi Aloha. I cannot imagine a more warm and fitting conclusion to a cold, flurry filled New York evening. Congratulations to all on a wonderful event. For more information, visit www.kumuhina.com. Were you in attendance? What did you think about the film? Please share your comments.